Intuitively integrated with an easy-to-use interface, Tracker ePrescribe is the real-time tool for Tracker users to create, store and send prescriptions electronically to retail pharmacies. This new service includes built-in drug information to help you make safer prescribing decisions. 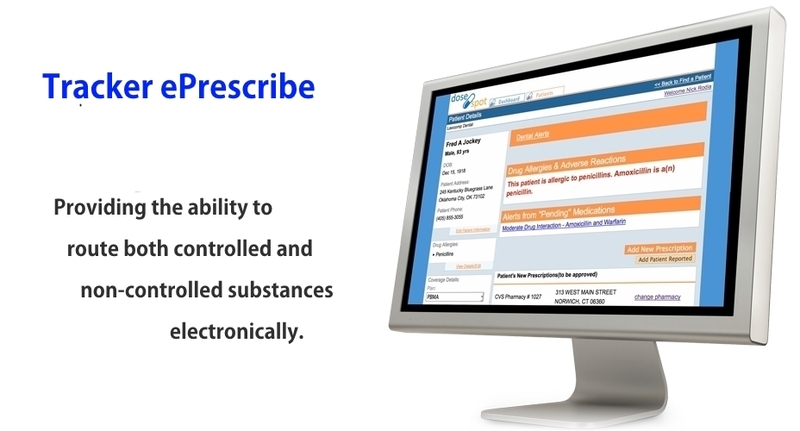 Tracker ePrescribe can help you comply with government requirements and enhance your effectiveness and efficiency. Route electronic prescriptions for non-controlled and controlled medications to over 67,000 retail and mail-order pharmacies. With a few clicks the electronic prescription is sent to your patient's pharmacy in a safe and secure manner. Electronically route prescription renewal requests and responses to your patient's pharmacy. With your patient's permission, you can use the service to securely access aggregated prescription historical data from community pharmacies, as well as patient medication claims history from payers and pharmacy-benefit managers. Request real-time information on patient eligibility and formulary at the time of prescribing. This important information can provide you insight into the cost of a patient's medication and can even suggest cheaper or alternative medications covered by the patient's insurance plan. The Tracker/DoseSpot integrated platform cross-references/checks a patient's online medication list for dangerous drug-to-drug and drug-to-allergy interactions. CLICK HERE FOR A FREE E-PRESCRIBING 101 GUIDE!